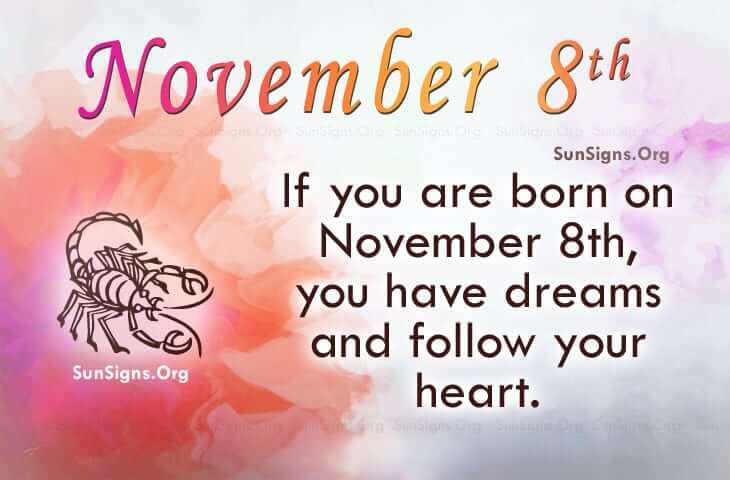 Famous people born on NOVEMBER 8 have dreams and follow their heart. As a Scorpio, they tend to do the right thing for people and for themselves. They have great instincts and it becomes useful in decision making. Typically, one could say that they are different from the rest. They see things in a different light from other people. It seems to work for them as they are determined and likely to be an overachiever. It’s not something they like to tell everyone but they continue to make efforts and this they can see. On that note, anyone interested in the famous Scorpio born on November 8 shouldn’t ask too many personal questions. This could be a big turn off to the Scorpio. It is suggested that they may have some issues regarding trust. However, they want people to confide in them. This, my friend, is a double standard. They need to be fair in their relationships. Normally, they are easy going individuals but they can be self-generated. What this means is that they can sometime break the rules or at least bend them a little. Famous people born on NOVEMBER 8th are a no non-sense kind of person. They do not like messy people as they plan a life that includes an appreciation of life, positive people and a lot of love. They are not an easy one to get to know and their love life may suffer because of it.